Ward Cartoonist: Are You Ready for Some Football? Thanksgiving is all about punishing ourselves. From playing football in the early morning hours at the end of November, to eating so much pie that it literally hurts, to watching the Dallas Cowboys win more often than not. 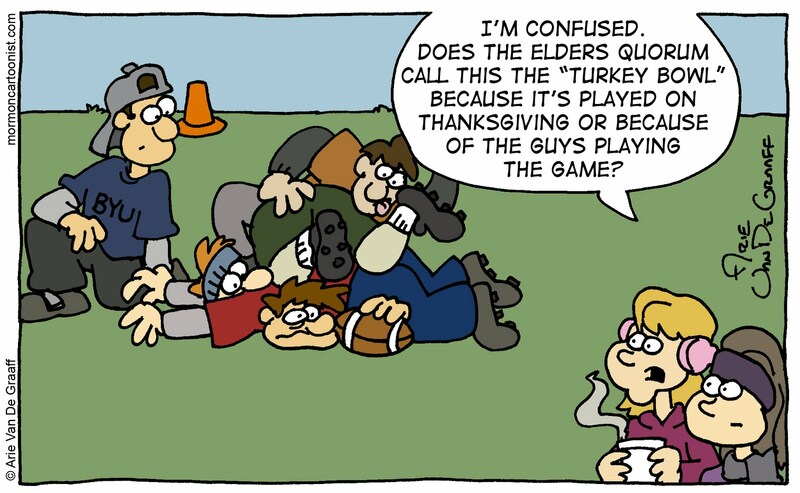 Annual turkey bowls are the strangest of Thanksgiving traditions, though. Wouldn't a sparkler bowl played on the nice, warm 4th of July make more sense? Maybe we play it on Thanksgiving so that we can remember to include "failure to lose any fingers to frostbite" to the list of things we're thankful for. I mean no offense to Dallas Cowboys fans with this post. As a Detroit LIons' fan I am more offended that my team wasn't mentioned. Everyone forgets about us. Oh come on Arie, you always mean offense to Dallas Cowboy Fans. They've been hated by our family for years, although I'm not really sure why. Really, Jena, you're not sure why? Here are some reasons the Van De Graaffs hate the Cowboys: 1971 over the Vikings, 1975 over the Vikings, 1977 over the Vikings, 1992 over the 49ers, 1993 over the 49ers. I think I'll leave it there and not go into the obnoxious "America's Team" stuff. 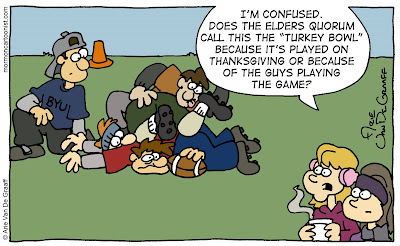 We all know the real purpose of the Turkey Bowl. It's an excuse for all the XY chromosomes to get out of the house at the precise moment they're most needed to mash the potatoes, mix the gravy, cut the beans, and set the table. Can you imagine what would happen if all the LDS women were to suddenly decide to launch a Thanksgiving morning Turkey quilt-a-thon and just assume that the cooking will "just happen"?